Those are some rad designs, D3ath. Though how are you gonna implement the MG61, since you already have the Venom Gun? Jeimuzu73 wrote: Those are some rad designs, D3ath. Though how are you gonna implement the MG61, since you already have the Venom Gun? It's gonna be one of the disposable heavy weapons that can't be dual wielded or cross wielded. You can disassemble the heavy weapons to further upgrade certain weapons. In this case, disassembling MG-61 will upgrade Venom Gun. Nice to see ny ideas serve as inspiration! I wish i had your creativity for Frankenspriting at the moment because... damn i haven't created a good plasma-BFG-esque weapon in months. Oooooo Badass and Big Weaponry. And i thank you for using my resources too! That definitely looks like it's from the good ol' era of doom modding. Pretty cool! I made a Sniper's Rifle / Designated Marksman's Rifle. The scope is based on a graphic by MatthewTheGlutton, from his Hideous Destructor, with permission, the rest is made from Id sprites. Use as you feel like. No reticle included, figure that out yourself. ChopBlock223 wrote: I made a Sniper's Rifle / Designated Marksman's Rifle. Tried to figure out a player sprite design for MetaDoom. 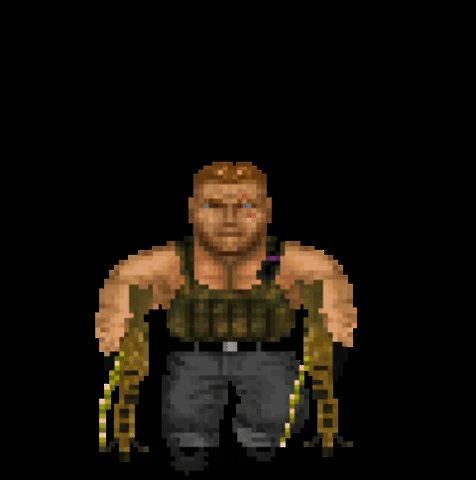 It'll need some rethinking - the Doom 3 belt would basically be covered up by the player's gun the whole time - and I never got around to the feet (wanted to use the Doom 2016 feet but couldn't get it right and didn't have any sprites with appropriate permissions handy) - but it's something to look at, at least. Pretty neat and new, while trying to keep up the each doomguy's design imo! And i think his belt looks very big. Why not make the chest armor large as well? To fit the belt's width. 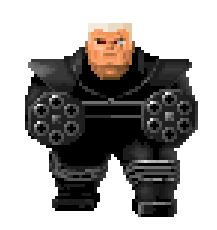 Kinsie wrote: Tried to figure out a player sprite design for MetaDoom. what was based off of? Looks awesome but i thought that to represent the Slayer's praetor suit from 2016, you could add a red dot somewhere in the armor and maybe some red thing in the helmet to represent the "mark of the slayer". And with Eternal, would it be crazy to add the shoulder canon? I mean, the way how inventory works kinda resembles that. An extra detail could be a red dot in the back as a reference to Doom 2's cover art (the one where he fights the cybie) but that's just a silly idea. 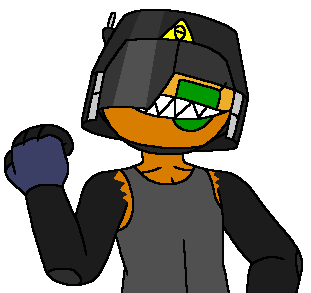 So finally completely revamped one of the boss characters for Shadow Elite. Vogol. One of the leaders of a Russian faction. Quite happy. Looks way more realistic and believable then the old Wolf3d RTD Boss. Knees look weird after I attempted to make him taller. If you're willing to put together your own concept/prototype, I'm willing to consider it.